29-Mar-2013 -- This confluence visit is the first out of 2 visits during our stay in Cyprus. We flew into Lárnaka, rented a car for 5 days and started our tour around the island. It was the long Easter weekend in central Europe, but we had to learn that in Cyprus they celebrate Easter according to the Orthodox calendar. So this year Easter was scheduled for the beginning of May. We missed the celebrations, but we also missed the crowds filling up the hotels. In the morning of confluence day, we drove from the capital city Lefkosía (Nicosia) to the Tróodos Mountains where this confluence is located. We parked on a little forest road in 1.5 km distance. It would have been possible to drive much closer, but we were up for a little hike. 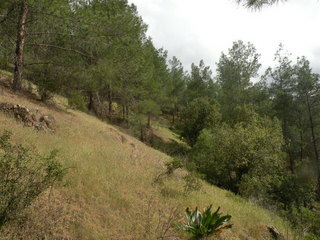 We walked along forest tracks up to a distance of 80 m, from where a steep climb upwards through a pine forest began. The confluence is located on that steep incline in the pine forest with clearings. There is a grass cover with some yellow flowers and tulips. To the west, there is a great view into the Tróodos mountain ranges. When we wanted to leave, I noticed an odd-looking stick just 5 m from my measured confluence location. I thought it might be some marker from one of the previous confluence visitors. But then, I was able to remove the upper part - revealing a strange casing. It actually looked dangerous and I suddenly felt that it was not my business to examine it further. So I put it back into place. In the evening, we stayed the historic mountain village Kakopetriá, which is 10 km further in the next valley. Vegetation: Pine trees, bushes, grass, flowers. More pictures of the trip can found at mautz.net. The story continues is at 35°N 34°E.